At what point do you give up on a writing project and accept that whatever you might think of it yourself, if it keeps being rejected by publishers then perhaps it just isn’t good enough? It’s a question I’ve had to ask myself a few times, because regardless of the fact that I’ve had over 150 books published, I still have a reject pile of manuscripts that haven’t found a home. Of course, multiple rejects aren’t uncommon: Harry Potter was rejected umpteen times, as was Watership Down, before some discerning editor took a gamble on them. Normally, though, if a manuscript has been turned down a few times, it’s an indication that something isn’t quite right about it: it’s not well enough written, the plot is flawed, the characters aren’t well drawn, there’s no market for it, it lacks authenticity, the voice is wrong, it doesn’t appeal – the list is endless. The trouble is that when a story isn’t quite ‘there’, different publishers may give any number of different reasons why it doesn’t attract them, and that makes it really hard for a writer to go back and try to rework it. I’ve had this a couple of times recently, once with a story for the 7+ age group, the second with a novel for children around 9+. In the first instance, every publisher the story was sent to came back with an entirely different reason for not commissioning it, until I lost heart and confidence and put it away in a folder in my garage. (I’ll dig it out again one day and will no doubt spot straightaway what was wrong with it, because that’s what often happens.) In the second instance, I again received several sometimes conflicting comments about why my story didn’t work. This time, however, I was absolutely certain that it had enough going for it that I could/would somehow make it work. Being honest, when I re-read it once more I could see that the storyline was flawed and lacked authenticity. The voice was wrong and there was a remoteness about it. The first thing I did was rewrite it in the first person rather than third. I’m normally very good at knowing which works best, so why I didn’t spot from the beginning that I had got it wrong in this case I really can’t say, but it immediately made a massive difference. It was hard work, though, because it meant a lot of changes – not just a question of changing ‘she’ to ‘I’. 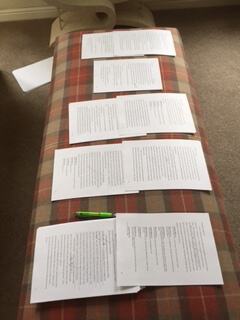 This second novel has been in the pipeline now for some 2 years, and I’ve finally got it to a point where my agent (she’s been invaluable in the process) can present it to publishers again. It’s been the most difficult thing I have ever written, I don’t know why, but all I can hope is that a publisher somewhere will see in it what I see and bring it to market. If not, I’m not sure what I will do. People have talked to me a lot about self-publishing, and that’s something I need to explore anyway for my backlist, but would I have the confidence in my book to self-publish it if it’s been turned down again by a number of different publishers? Would that be too arrogant of me to believe that I know better? I can’t answer that, but I suspect that the 44,500 words will land up in a folder in my garage, never to see the light of day. In the meantime I’ll keep everything crossed that it will be published in the traditional way – and sometime soon!